Since I couldn't work on the deck today, (no materials) I decided to start my own project of putting in a window on the west side of our house. 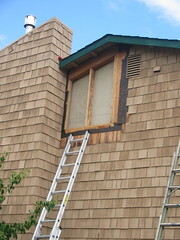 The shingles came off pretty easy and I was lucky because a sheet of plywood was just where I needed--no cutting. Now I am ready to frame in the new window. I'm going to try to frame it from the outside without cutting the sheetrock. Should be interesting!